Today is James’ 16th birthday! We officially celebrated last week so some pictures from the party are here. We are so grateful for this last year and all the changes it has brought. 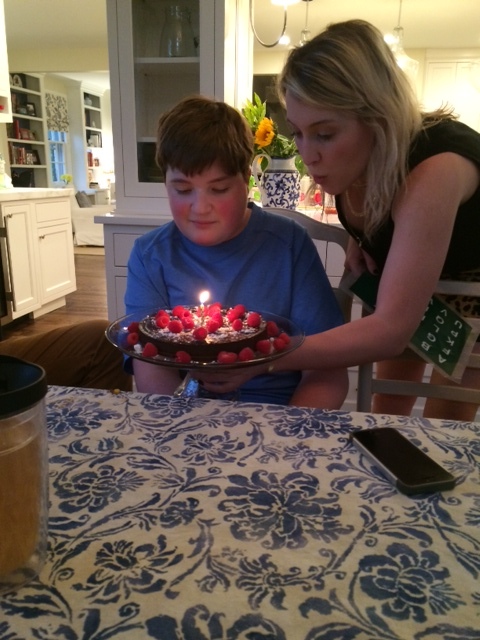 James asked me to put his birthday thoughts on the blog so here they are: “I can’t believe I am 16! Have I really changed this much in a year? I keep remembering my old life and wonder how I made it here. Birthdays are a good time keeper. Last year I was jealous of Meredith but had no word for it. I felt anxiety but mistook it for hunger, and I thought I was a genius but I was wrong. I have learned so much this past year, about the world and myself, but I have so much more to grow. I want to thank everyone who has supported me on my journey”. We have a great group of local families working on full communication for their kids using RPM and other forms of typing like Facilitated Communication. 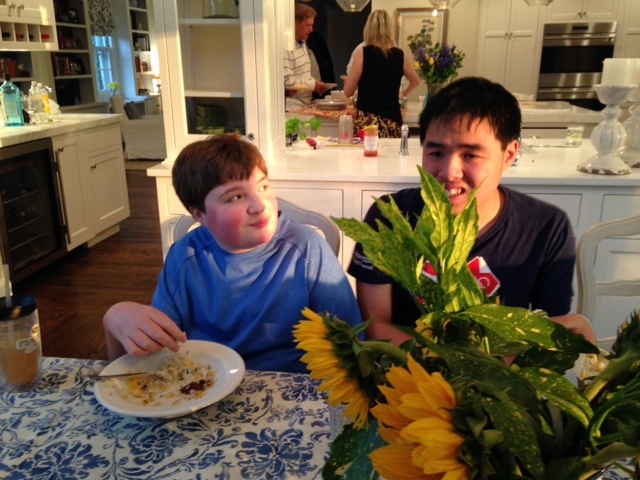 We meet in various settings and this week some parents met at our house and we asked James and his friend Huan to share thoughts with the group as well as answer questions in a panel format. Huan is 18 and is a close friend of James. His public school setting is very difficult, so people in our community are working on getting some much needed change in the district. James feels strongly with Huan that a full, mainstream education is a right that is being denied many people with autism so they spent some time discussing this with the group. James opened the meeting with the following statement and some of his other comments are below as well. I began my journey 2 years ago with Soma. Then Elizabeth. Then Shannon. Occasionally, I remember that fall of 2013. I remember how hard it was, the grunting, and the hope. That Christmas I wrote letters to each member of my family, my first true words to my siblings, but it took days. Now I attend a homeschool group with my best sidekick, writing literary analyses. I also fit in clothes, go to Awana, have real friends, and I typed this whole thing in under 30 minutes on a Friday afternoon. These pale in comparison to becoming who I am independent of autism. Shannon listens and guides me on my journey because I am more than autism, I am James. Parent Question: What is the best way to deal with people or therapists who talk to you like you are a baby? James: They will learn when I tell them my thoughts. If they don’t listen, they will never get it. It’s not worth my energy. James: I don’t want to go to (public) school but others do so it is important we help. Huan is the warrior, we need to help him. Parent Question: How and when did you learn to spell? James: I taught myself out of boredom. I was always trying to prove to myself I was there. Parent Question: What do you think of the current definition of autism that states it is primarily a disorder marked by social deficit? Do you think that might change? James: My body betrays my thoughts. People react to what they see, but it is a motor disorder not social (disorder). Parent Question: Explain the role of the person who holds the letter board for you. How is different than typing on a keyboard independently. James: I need the independence but love and need the person.